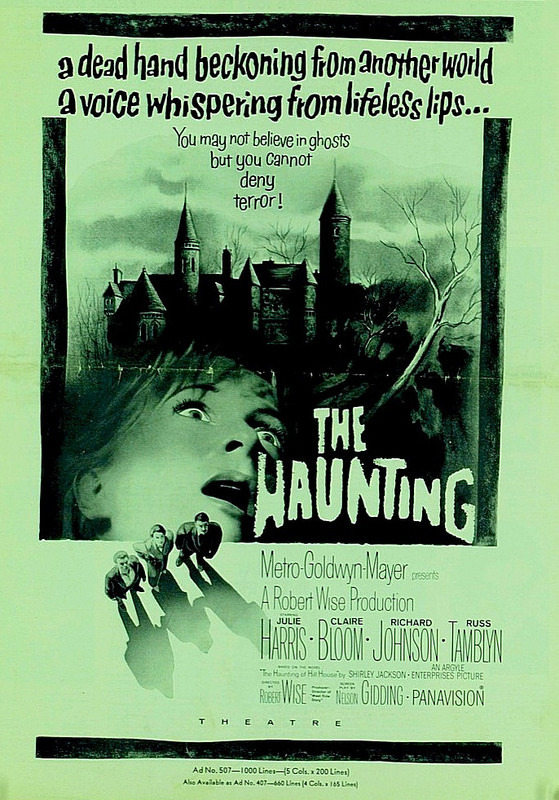 The Haunting is a film adaption of a book I read recently called the Haunting on Hill House. I’m assuming they thought the title would be too long which is why they shortened it. I don’t really care too much or really at all about that change but the movie makes a lot of other changes during its run and pretty much all of those are pretty bad. Whole characters are cut and bits of their personalities couldn’t get a chance to shine either. A movie adaption is almost always an abridged version of the book as it’s just hard to fit everything into a movie unless you make it two parts or very long. Still, the film could have done a much better job of sticking to the script. The film starts off with a montage of murders as Hill House decides to clean up and murders a bunch of people. We then skip ahead a few decades as a professor wants to rent the place out to see if it is really haunted or not. His request is accepted on the condition that he brings along the future heir to the house to make sure the Professor doesn’t try to pull anything. He also hand picks a few individuals who have a history with the occult but only two people show up. First is Nel, a poltergeist survivor. The other one is Theo, a master of esp. Can this brave bunch prove that the House is haunted or has one of these individuals already been turned? Either way, staying alive could be rather difficult. One of the main aspects of the book that I kept mentioning in my review is how strange all of the dialogue was. Everyone sounded really crazy throughout so it was always hard to tell what was going on. Was the house affecting all of their mentalities or where the characters already crazy? The movie doesn’t keep most of that in and instead portrays Nel as really shady right from the get go which changes the whole dynamic of the story. It’s less of a mystery now. I can’t say that I’m a fan of Nel in either versions but this one certainly seems a lot more villainous. She is willing to bump off her rivals so she can chase after the scientist and that romance plays a bigger role here than in the book which naturally makes her less of a sympathetic character since she appears desperate. The movie also toned Theo down a lot. In the book she appears to enjoy the more brutal aspects of the case and has a morbid sense of of humor. While the film keeps in her taunts against Nel, most of her other lines are nowhere to be found. She is certainly one of the most enjoyable characters though and in the movie she is the best one. The handles the situations pretty well for the most part. The scene of her being terrified of the noises honestly seems rather out of character for her but I guess it’s hard to stay fearless in Hill House. The Professor is also a lot weaker than his book counterpart thanks to Abel’s attempted romance plot. While he didn’t completely crack he did skate on some thin ice by the end and he could have done a much better job of handling the situation. Luke was pretty true to fork the whole time though. He doesn’t buy into the ghost business and talks a pretty good game the whole time. The movie cheats him out of his big scene where he saves Nel of course but I think most of his scenes still seemed to be in tact. It’s always good to have at least one skeptic in the group or they will just get scared too easily and that would just hurt the dynamic. That’s why cutting out the other tough character was such a bad move though. In the book the wife arrives with a companion who has a gun at the ready and believes he is too sophisticated to be scared of ghosts. He actually doesn’t even end up being scared so it was an interesting way for his character arc to end. The Wife also looked a lot better as the ghosts couldn’t lay a hand on her. Even the Dudley’s were given a greatly reduced role which was unfortunate since they were the best characters in the book. Well, Ms. Dudley was the best anyway, the other guy was okay. The film even cut out the moment were Theo nearly ran the guy over. I can understand cutting the coffee scene near the beginning though. All in all the book just handled everything a lot better. While the book is the better version that’s not to say that the movie is bad. The review has been negative so far because I’ve been comparing it to the book. It’s a little disappointing that if couldn’t do a better job of adapting it. That being said, it avoids most of the pitfalls that horror movies fall into. For starters there is no animal violence so that is a good thing. There isn’t even much in the way of normal violence which is nice. The opening can be a little dark with how everyone keeps dying but I think it does a good job of not being really graphic or anything like that. The writing is still pretty solid. The characters talk like actual people and the dialogue is strong. The film does a good job of always keeping the atmosphere tense even if the characters do seem to overreact. I do think the Professor and Luke would have had a better time if the other two hadn’t shown up. While Theo and Nel panicked a lot, the other two were usually as cool as a Cucumber. Even then they weren’t quite as relaxed in the book. That does lead to one area where the film may beat the book. The pacing feels a lot quicker in the movie as things tend to happen more regularly. In the book it sometimes feels like nothing is happening and even after finishing the book it’s like not much occurred. In the movie since you could see things shaking and all it worked a lot better. At least I can give the film some kudos there. It’s still a slow burner but one that is a little more action packed. Overall, The Haunted is a good horror film from the olden days. This was back when making a horror film was about atmosphere instead of content. I’ve spoken enough about the book so I won’t even say you should just read it instead of watching the movie. What I will say though is that this movie is worth checking out. It’s not perfect but it does a good job of encompassing what a horror film should be like and doesn’t make many mistakes in the process. That’s always the end goal in a film so since it keeps you entertained while all the way through as well, it’s a good movie. Watch it before you read the book to appreciate it more. This entry was posted in Live Action Movie Reviews, Live Action Movies, Reviews and tagged Atmosphere, Film Review, Ghosts, Haunting on Hill House, Horror, Movie Review, Review, Slow-Burner, Supernatural by dreager1. Bookmark the permalink. Glad you enjoyed the book, its one of my favourites. Have you read the Woman in Black? That’s a good spooky story as well!